While a great idea, I'd think it would be more like printing movies or video games. All the consciousnesses are duplicated in the process of creating the new being. The information is fully recorded and produced, not a single consciousness spread out over multiple bodies. I mean none of the psychos seem to get any smarter after killing 1,000 of them. So the consciousness isn't spreading or condensing. ﻿ In Borderlands 2 Handsome Jack is now in charge of Hyperion and is what one might consider a MASSIVE ego maniac. Hyperion is the owner and producer of the New-U stations so why not make use of this great potential? 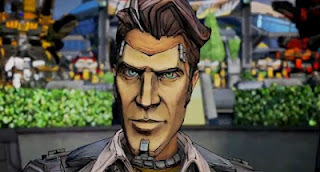 If anyone would want to make an entire planet love him it would be Handsome Jack- and a whole Pandora of Handsome Jack's would certainly love itself. ...Or would it hate itself and all the Jacks would end up fighting each other to be the greatest Handsome Jack ever? Moxxie could sell a billion tickets to that show. Unfortunately for us, the Hyperion corporation has found a wonderful way of keeping their employees alive even after the worst case scenarios have played out. Which also means Handsome Jack may survive death with "Infinite Continues," so to say. They could also use it as a horrible torture device- torturing people to death, resurrecting them and starting all over. They could also possibly track people's movement with the New-U post activations. There are tons of possibilities. So many uses. The good part of this New-U system is all the DNA samples could prevent extinction. The bad part is that beasts like Skagzilla, the Rakk Hive, and Crawmerax the Invincible have all clearly been part of this as they all return repeatedly. Well, just some food for thought while waiting through the next month until the game is released. I am so excited for this game. Happy hunting for all of you fellow Vault hunters.